As publishing lore tells it, the “book tour” used to be a common tool for authors to sell and promote their books, but in recent decades publishing companies have become less eager to commit resources to a marketing strategy that has gotten increasingly less effective. So I was a bit surprised — and honored — when my publisher asked if I’d be interested in going on my own fifteen-city book tour for Trespassing across America. The tour — organized and funded by my publisher — began in late April in Washington D.C., the day after my book published. It ended last week in New York City. On my first morning, I began with a radio “satellite tour” from my hotel landline on which I’d talk to seventeen different radio stations, one after the other, in a six-hour timespan. I was a little nervous for my first radio interview, which would air in Dallas. I was anxious to pitch my book in a compelling way. I wanted to give crisp and articulate answers while also coming across as carefree and charismatic. But by 1 p.m., with sixteen rapid-fire interviews under my belt, I was leaning back in my fake leather chair and giving answers in my final interview as comfortably as I possibly could. 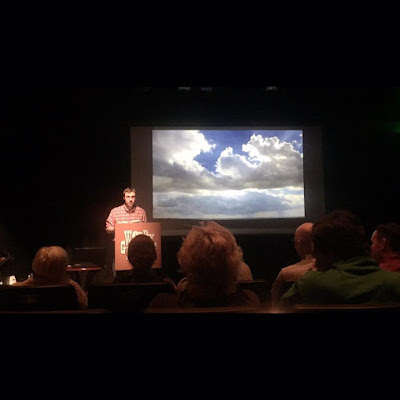 So, that night, when I got up in front of my first audience at the Politics and Prose book shop in Washington D.C., I felt oddly confident, even serene, like I’d already given this talk seventeen times before. A book reading can be extremely “hit or miss.” It’s hard to predict where you’ll have a good turnout, and where no one will show up. I had about twenty people show up for my Washington D.C. event, close to fifty for my Greensboro event, and less than ten for my events in Lincoln and Omaha. What gives? I was puzzled. I figured that all three of my events in North Carolina were hits because I had book reviews in two of those cities and a local NPR interview that aired statewide. Yet I also had good interviews published in newspapers in Lincoln and Missoula, but those events were lightly attended. I had no exposure at all in the Wichita and Tulsa press, yet they were among my best events. It was unpredictable. My talk, itself, hardly varied from one reading to the next. By the end of the tour, I’d subtracted about a minute’s worth of ineffective content, but the talk was more or less the same from the start of the tour to the end. My talk is about my Great Plains journey, broken apart into sections that are designed to evoke different emotions. The beginning, when I explain how I planned my journey, is supposed to generate excitement. When I discuss my environmental-minded motivations and describe the tar sands of Northern Alberta, I hope to bring out a feeling of sorrow and outrage. When I discuss my hike and my mistakes, I try to make the audience laugh. Lastly, I end on a note of suspense to goad the listener to buy my book. One of the interesting things I observed is that audiences almost always respond in the exact same way. I always knew when I was going to get laughter. I knew when I was going to get nervous titters. I knew when I was going to see a little emotion in my listeners’ eyes. When I was asked if I ever felt lonely on my hiking journey, I told the story of when a coyote ran away from me and how I wanted to yell, “Come back!” This story wasn’t meant to elicit laughter, but it got laughs at every reading, and I made sure to retell it along with other material that had gone over unexpectedly well. 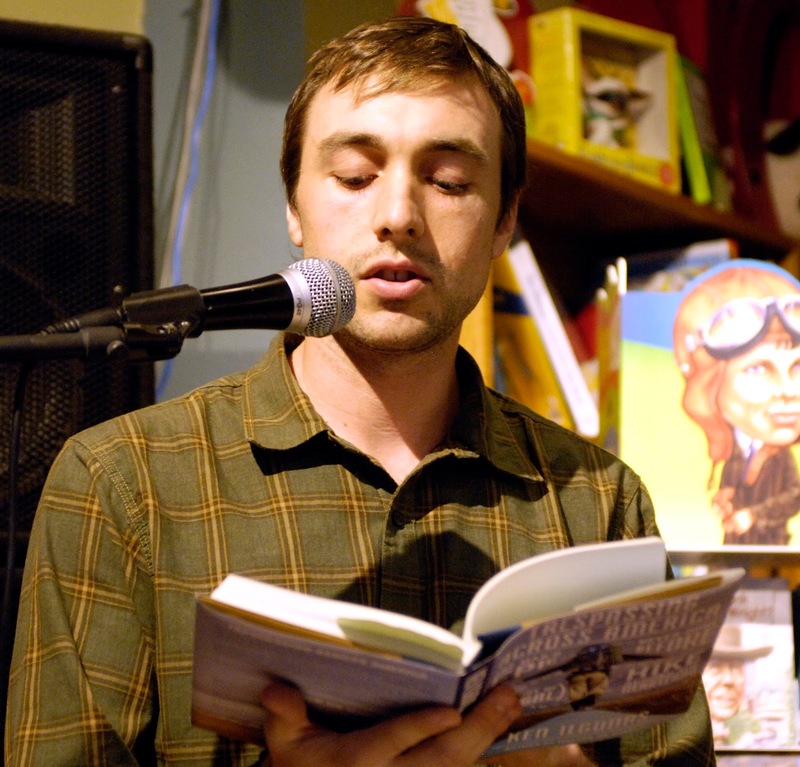 The worst and most boring part of a book reading is the actual book reading. So don’t read! I’d read only two short passages that took up less than two minutes of speaking time. Keep the talk short (20-25 minutes) and rely more on the Q&A. Meanwhile, the book reviews began to trickle in. I googled my name every day and found neutral-to-negative reviews from Kirkus and the LA Times, and good ones from a number of mid-sized papers, like The Buffalo News, Asheville Citizen-Times, and Greensboro News and Record. Everything about this is mostly unpleasant and emotionally exhausting. Bad reviews stick with you and hurt for a good 48 hours. The good reviews only make you hungry for more, and you end up feeling nasty pangs when they don’t come. You reach a point where you say you're never going to read a review again, good or bad. You’re terrified of the absolute lack of control you have over the whole "promoting" process and simply want to move onto your next project, where it’s just you, an adventure, and the open canvas of a fresh Word doc. As for my book tour talk, it never varied. The reception of it, however, did, and this reception depended on a few uncontrollable factors—namely the quality of the venue and the size of the audience. For audience size, bigger is always better. When an audience is small (like six people), it makes audience members self conscious. And because there is no one laughing around them, they don't want to be the lone, crazy laugher, so they're less willing to give in and immerse themselves in a collective emotional experience. So there I am, in front of six people, giving a talk with the same passion that I gave to a laughing and responsive audience the night before, but now all I can hear, in the spot where I normally pause for laughter, is the cappuccino machine gurgling in the background. These weakly-attended events can feel humiliating. I’d think about how I’d traveled hundreds of miles to go to this bookstore in order to talk about a book that I’d worked on for over two years and walked 1,700 miles for, and yet only six people show up! In Lincoln, I had three people in the audience (one of them a friend) at the 7 p.m. start time. I postponed the reading for ten minutes and about five more folks (who should be knighted and get go to heaven) trickled in. It’s moments like these — when your pride is wounded — that you feel gratitude for the friends who made an effort to show up (and resent those who didn’t). It’s then when you think, “I’m never doing this again!” You can’t help but wonder if it’s worth the trouble for your publishing company to spend the hundreds of dollars — on airfare, hotel, rental car, and food — to get you to one of these ill-attended stores where only half the listeners buy books anyway. There are other times, though, when you feel honored to be talking to a receptive audience that is interested to hear your story, thoughts, and opinions. When a talk is going well, and you know you have an audience that’s absorbed, you feel loved and appreciated. It’s then when you think that maybe suffering through the humiliation of a poorly-attended reading is worth experiencing the joys of a good one. My Tulsa, Oklahoma event was by far my best. 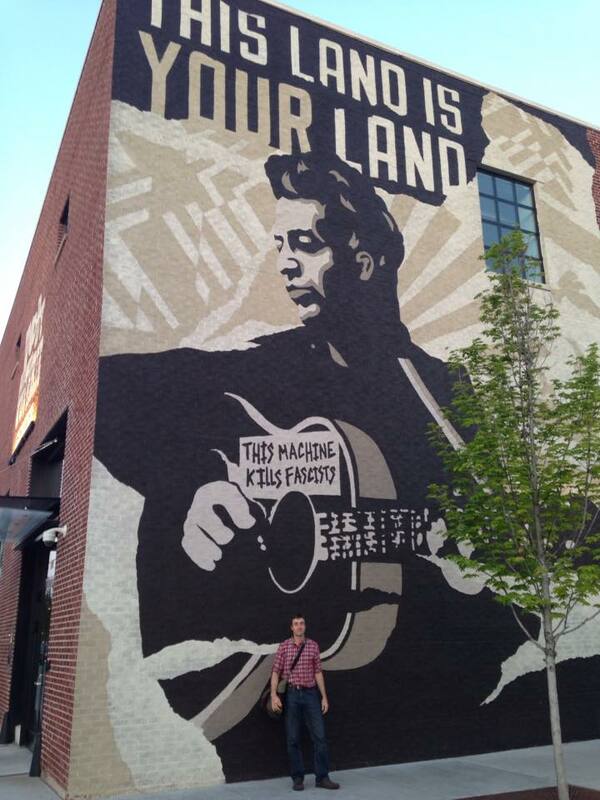 It was in a proper theater in the brand new Woody Guthrie Center. I had a proper stage with a big screen for my slideshow. I had a packed audience that I could only vaguely see in the dark. I had a warm light shining down on me. When I read from the script that I had just about memorized, I found myself talking more articulately. My pace was more comfortable. More natural. I took my time. I didn’t speed the talk up, as I sometimes do before non-responsive audiences. I got such good, hearty laughs that I’d often have to wait five to ten seconds to let the laughter die down. It wasn’t that I had suddenly become a better speaker. It was that the venue made the audience better, which made me better. 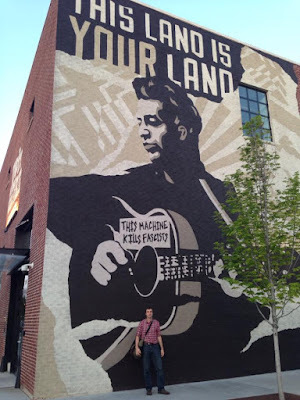 Tulsa event at Woody Guthrie Center. Credit Tim Landes Jr. In Buffalo, I had to give a talk in a bookstore where there was a rhythmic and very distracting thumping noise coming from the floor above. One audience member said he thought it might be a jazzercise class. At one point, plaster fell down from the ceiling. Between the poor venue and the small audience size, my talk suffered. I’ve found that the quality of a talk depends largely on the “crowdly atmosphere.” A loving crowd will no doubt bring the best out of a speaker. Some speakers, I’m sure, can capture an audience of any size or temperament, but, for now, the success of my events are largely determined by these uncontrollable forces. I also learned that the turnout for a bookstore reading has little to do with NPR interviews and getting reviews in local newspapers. Rather, it depends largely on the bookstore’s culture and their tradition of bringing in speakers. If it’s something they commonly do, aggressively advertise, and have a routine group of people who show up, the better your turnout will likely be, regardless of how much exposure you'd gotten in the local media. I could complain about the long hours of travel, the radio interviews that cut into much needed nap time, or my reliance on bad airport food, but mostly I felt grateful for this rare (most likely once-in-a-lifetime) opportunity. And I felt grateful to have a publishing company (that I very much wish to please) that believes in my book. 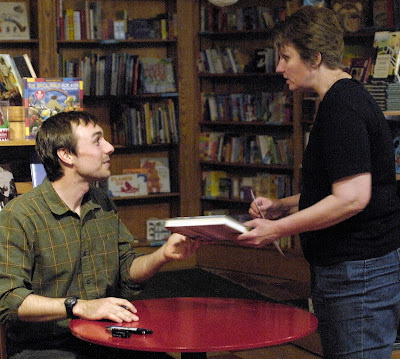 The success of a book tour is almost impossible to determine. I didn’t come close to selling enough books to pay back the expense of the tour, which probably cost several thousand dollars. (I’m guessing book tours rarely “pay off” in this way.) But the point of a tour isn’t necessarily to instantaneously sell a whole bunch of books. It’s to get the word out. It’s to get local reviews and exposure in local radio stations. It’s to get the book in the hands of folks who will write Amazon reviews, propose it to their book club, or buy another copy for a family member at Christmas. There are some things an author can do to to make his or her book successful. But, like a turnout for a book reading, most of a book’s success is outside of your control. 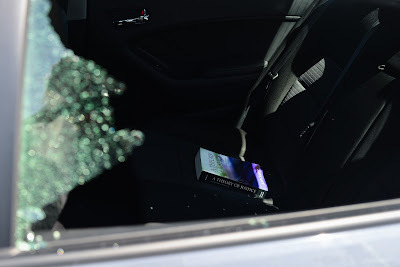 After the initial publicity push, it largely depends on luck, on what’s going on in the world at the time of the book’s release, or on how passionate the publisher is about your book. So part of dealing with the turbulent emotions that come from a book’s release is just reminding yourself that you’ve written the best book you could and that the rest of it is up to something as abstract and uncontrollable as "fate." More important than the book’s initial “splash,” anyway — you remind yourself — is how it's appreciated over time. 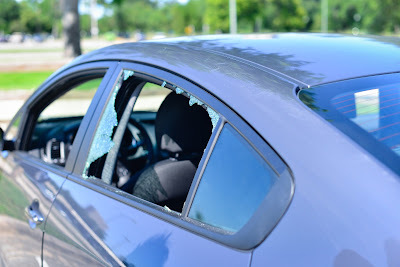 My rental car got broken into in Houston, near the Museum of Fine Arts. My lap top bag was stolen. A couple of notes: (1) It wasn't a great payday for the burglars. I'd left my laptop at the hotel and I had my iPad in hand for navigational purposes. 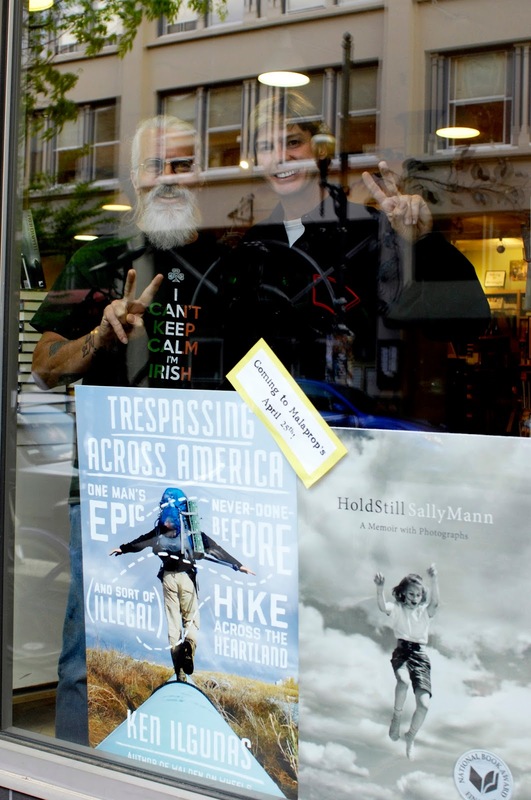 All they got was a copy of Trespassing across America, my book tour speech, and a few cords for my electrical devices. (2) When I tell this story, at least I get to say that I was out doing something cultural, and not "ordering a 5-for-5 at Arby's." We loved hearing you in Tulsa, but to be honest, I came prepared not to like you. 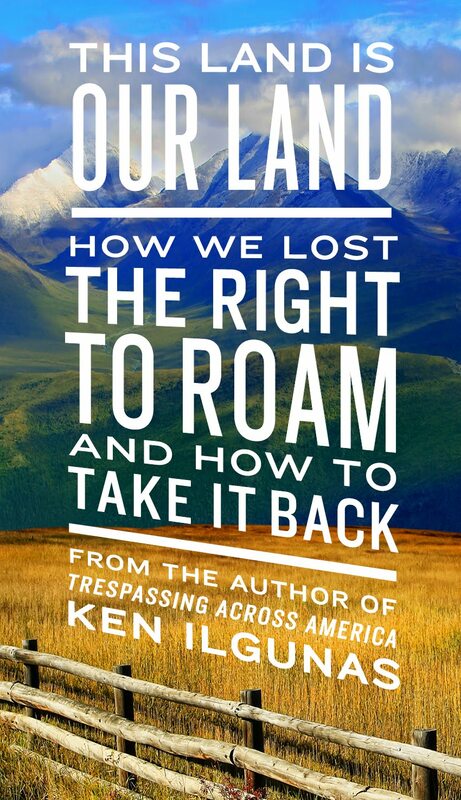 After all, you had trespassed across our farm land in Kansas! But you won me over a wonderful informative & humorous presentation, and when I read your book, I was happy to see that my little Kansas hometown even rated a couple of positive paragraphs about your arriving in town on Christmas Eve. As one of the 50 in Greensboro, I thoroughly enjoyed the opportunity to hear you speak and to get to meet you. Reading a book like this one is even more interesting when you've a voice and face for your mental narrator. Thanks for taking the time to come out and meet us all, and I'm looking forward to hearing about your next adventure! If you and your publisher decide on another tour, come out West. Specifically, come to Portland, a city of readers who would welcome you and your fine book, and home of many independent booksellers, including Powell's. Anon--Thanks for liking me. Tulsa was a lot of fun. Chris--Good to know. Will definitely do a reading there for my next one, if I'm lucky enough to have a next one. Leslie--I've gotten a few requests for Portland, which probably means I should come out there. Thanks for the encouragement. I wish I had know you were in Lincoln, NE for a book tour! I would have been there. 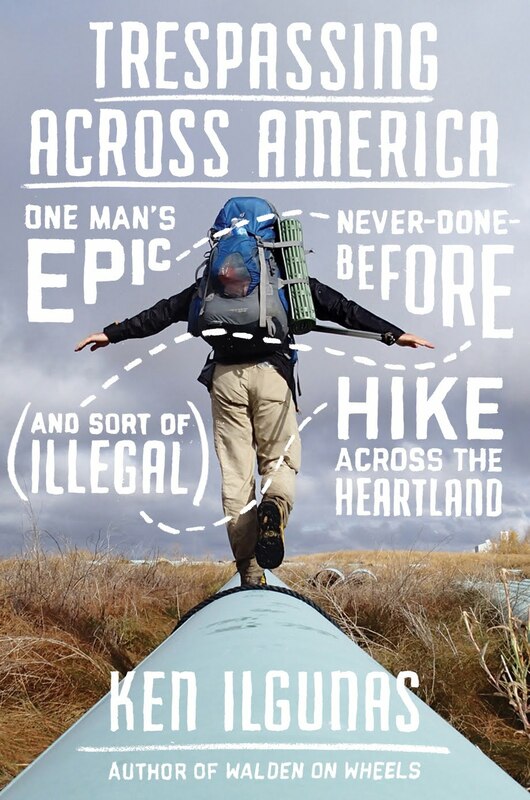 I just finished reading "Trespassing Across America" from the library and will order my own book today. Book tours sound a hell of a lot like running for local office. I'm looking forward to reading your book. 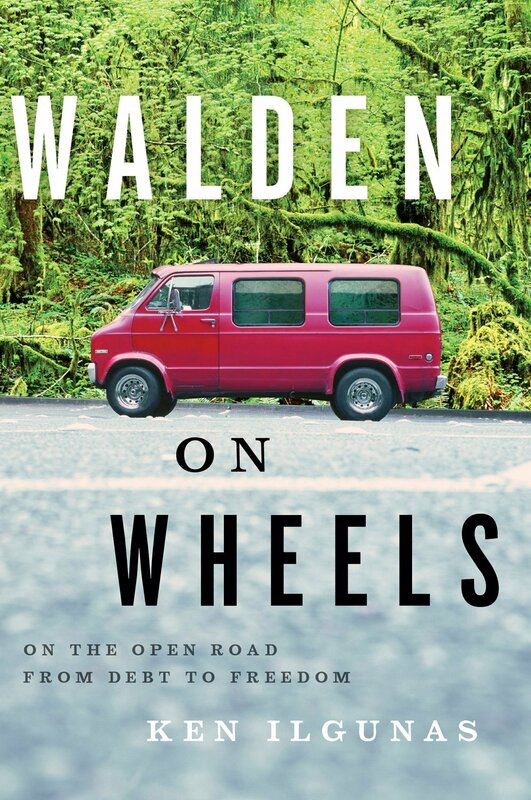 Hey Ken, I read your book Walden on Wheels (which is in my top 10) and just picked up a copy of your new book. I looked at your blog a bit but won't come back till I'm finished with the book, don't want any spoilers. Keep up the great work, maybe look into a festival trip for your next book. Follow a band or travel to different music festivals?? ?